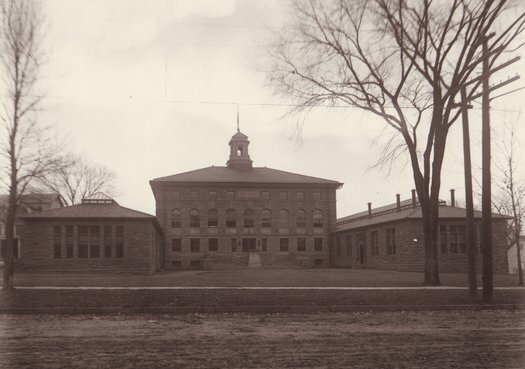 The sandstone quarries were an important industry in the first 100 years of Potsdam history. There were two quarries lying along the west bank of the Racquette River. 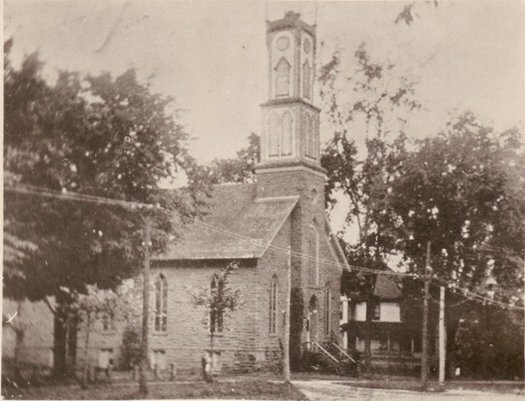 Clarkson Quarry was about 3 miles south of the village and ran between 1877 – 1894 and the Merrit and Tappan Quarries about 4 miles above the village. 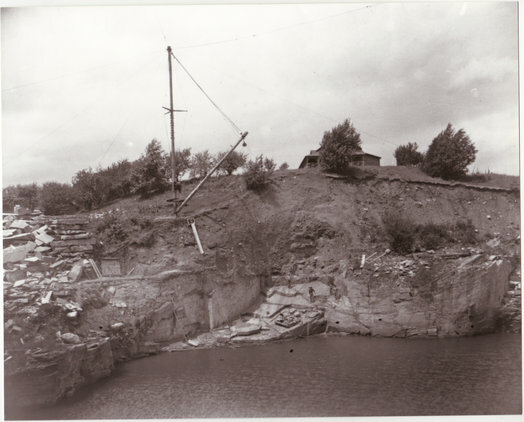 When the dam above Sugar Island Power House was built in 1922, the quarries were flooded and have not been used commercially since. 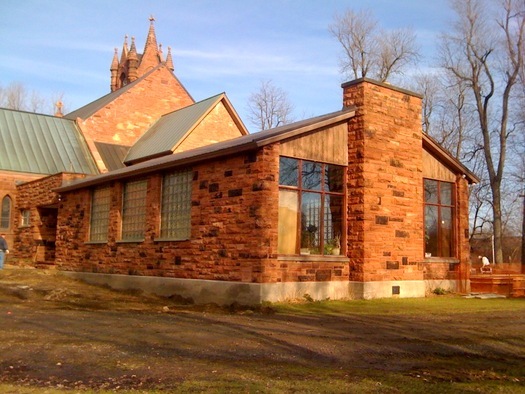 Potsdam sandstone, which was first quarried soon after Potsdam was settled in 1803, was made famous not only by its local use in the village and neighboring towns, but in many important and costly buildings in both the United States and Canada. 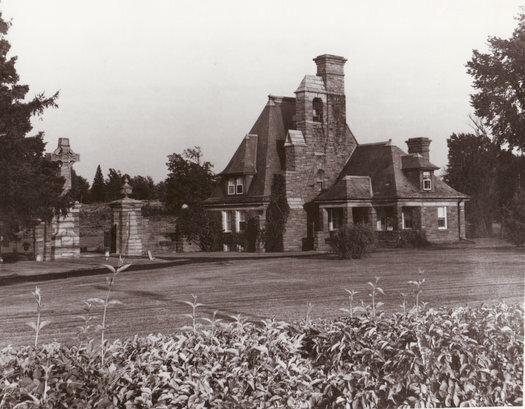 Evidently Sir John Johnson saw the sandstone, which was exposed on both sides of the Racquette, when he fled from Johnstown to Canada at the beginning of the Revolution. Later he made inquiries in Montreal as to what use it had been put to. 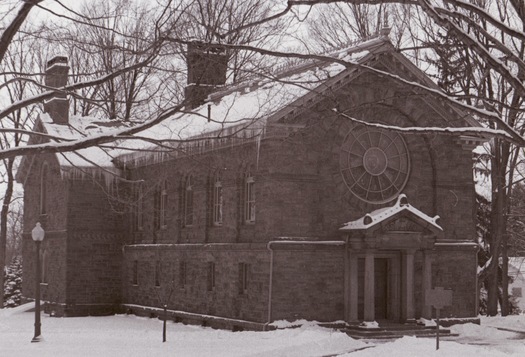 According to the Encyclopedia Britannica, geologists named the stone Potsdam Sandstone because it was first quarried here and geologists came here between 1838 and 1842 to study it. The Upper Cambrian system, which underlies a large portion of the United States, is known to geologists as the Potsdamian. 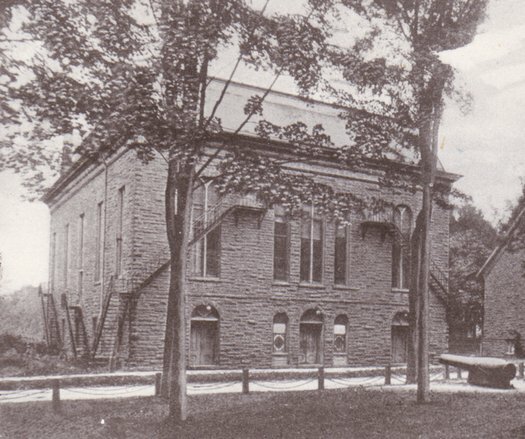 The Potsdam Red Sandstone Company operated several quarries south of Potsdam on both sides of the Racquette River. 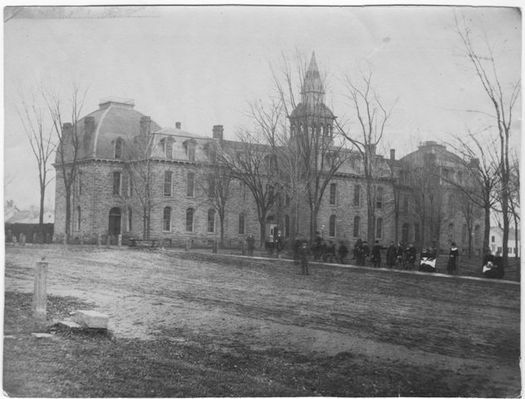 The Clarkson quarries were opened by T.S. 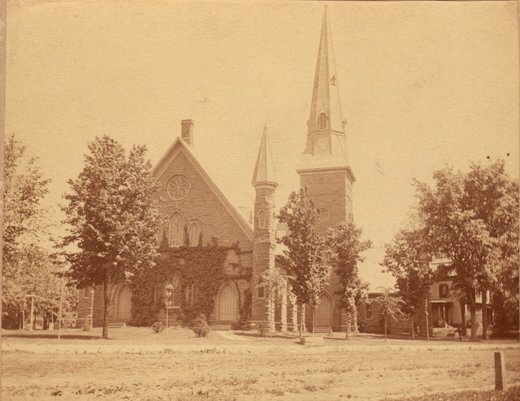 Clarkson in 1877 with cutting yards on Pine Street. The quarries were flooded in 1922 when Hannawa Power was developed and they were abandoned for commercial purposes. A new quarry was opened recently. The stone varies in color from a beautiful red to pink. It is a pure silica, harder than any granite and will last forever. It is found in even stratification which produces excellent flagstones. It has a softness when first exposed to the air which renders it easily quarried, and because of its silicious, engenders a surface of extreme hardness when exposed to the atmosphere. 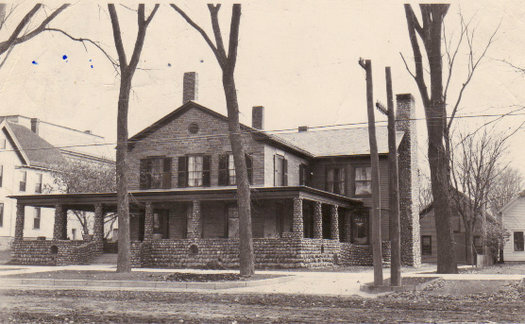 It was first quarried in 1800 by Captain Nathanial Parmeter to build his home on the Hannawa road, west side of the river. 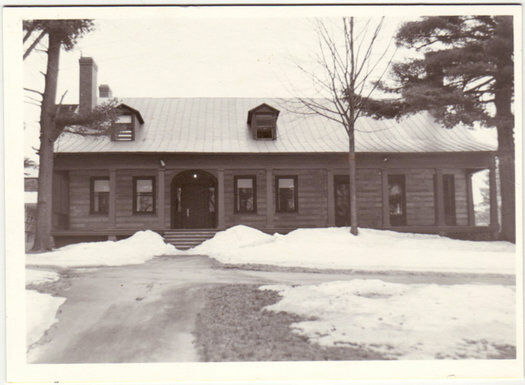 The home is now owned by Mr. and Mrs. Elmer Gordanier. 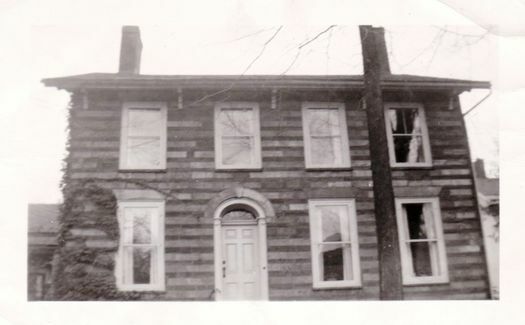 The sandstone house across the road from this house, now owned by Mr. and Mrs. David Garner, was built by Captain Parmeter in 1814. 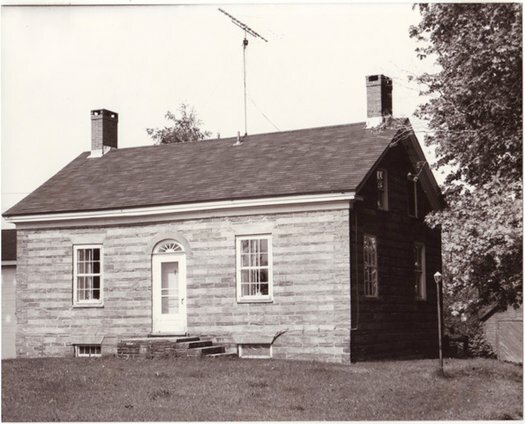 The wooden part was added in 1824. 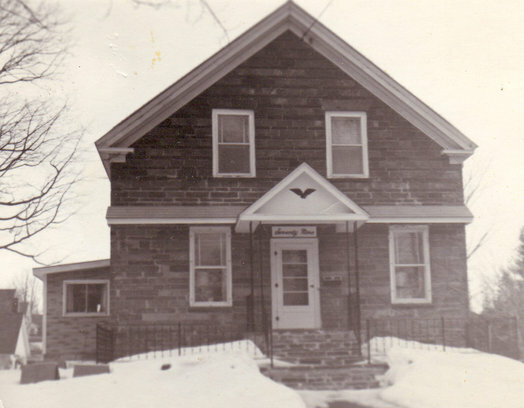 There are a number of sandstone homes on every road heading out of Potsdam. 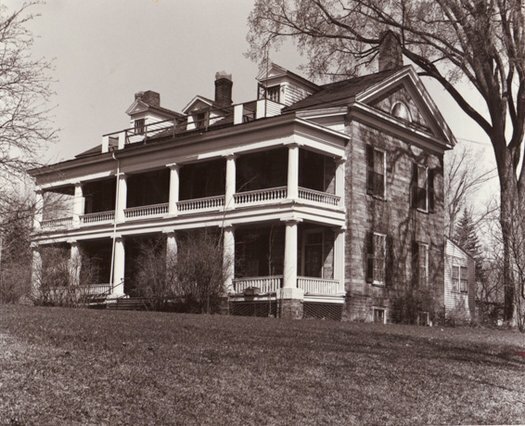 In 1823, John Call had sandstone used for his late Federal style residence at 10 Elm Street. 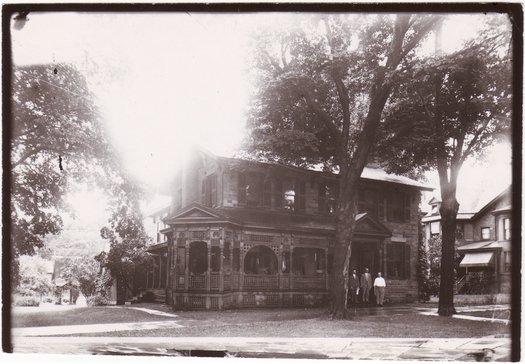 The house was built by George Train, stone mason, who lived at 54 Elm Street. Mr. Train also built two more sandstone homes, just east of the Call House. 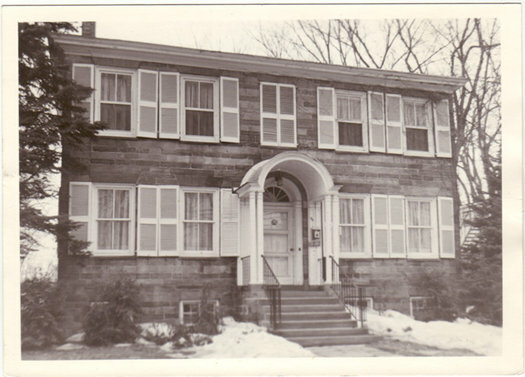 The Dart House at 12 Elm Street was torn down in the 1950s to make way for a gas station while the Tappan House at 14 Elm, later owned by Dr. and Mrs. Bill Carson, was demolished in 1964 to become the site of the Potsdam office of the Marine Midland Trust Company of Northern New York. 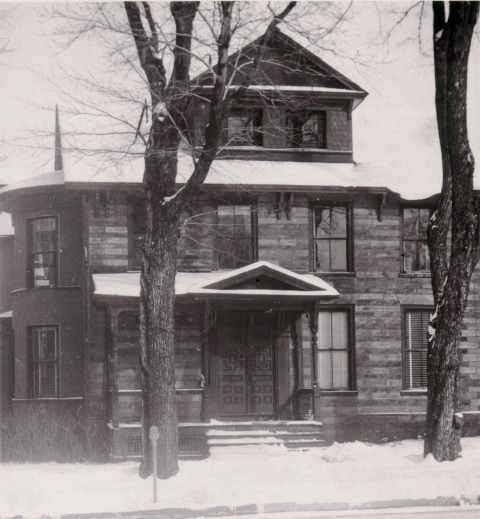 The Call House, now the Elks Club, is the only one of these three still standing. 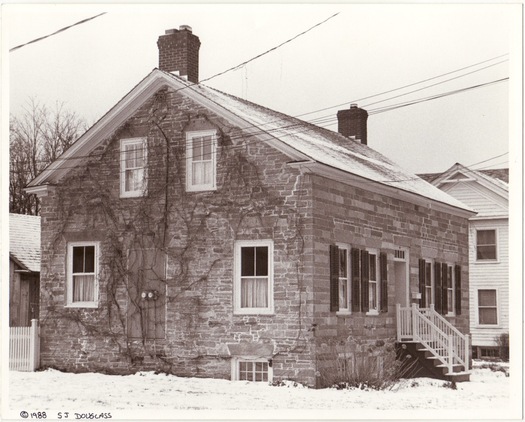 Another sandstone house built in 1833, which has been torn down, was the Azel Lyman house, 77 Market Street. 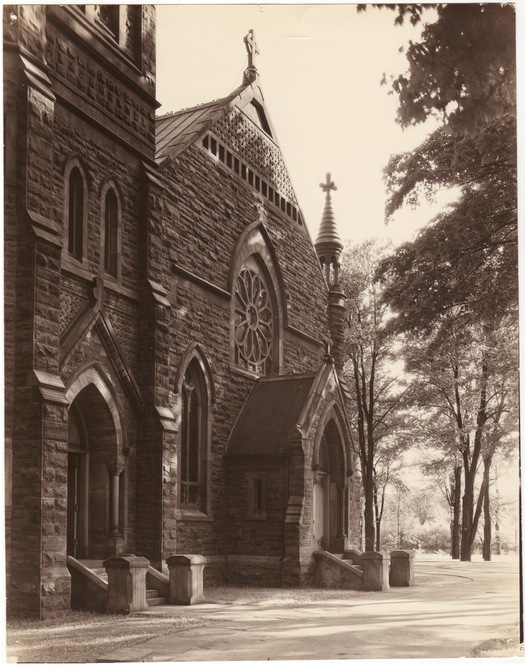 It became the site of the A&P Food Market in 1963. Today, just eight [seven] Potsdam sandstone houses in the slab and binder construction are still standing. These were all built prior to 1840. 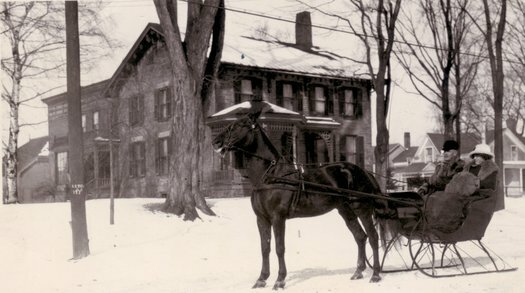 They include the Elks Club, 10 Elm Street; Woodstock Lodge on the Clarkson College Hill Campus, which was built in 1827 by Augustus Clarkson and now is a student recreation center; the Lockwood House, [demolished in 1998] built in Federal style at 29 Elm Street in 1832; and the Hopkins House, a Greek-revival home at the corner of Main and Union Streets, built in 1837 by Aaron Hopkins and now home of Zeta Gamma Sigma sorority. 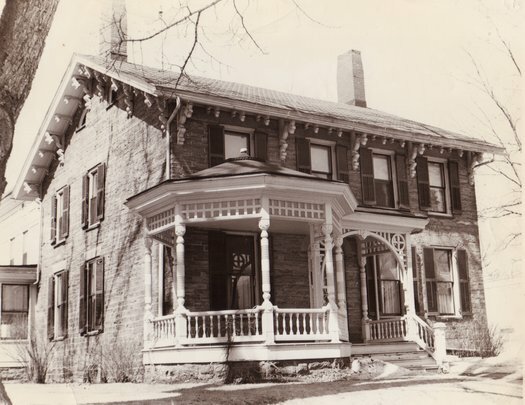 Also, the Howard H. Smith Home at 79 Main Street which was built in 1812 by Levi Brown and added to in the 1820s; the Sam Kaplan House at 99 Market Street, which is in Federal style and was built in 1828 by Mr. Wallace; the house at the corner of Division and Main Streets, built by Liberty Knowles in 1837; and the Merritt Apartments, a large Georgian mansion at 30 Leroy Street, which was built by David Clarkson in 1836. 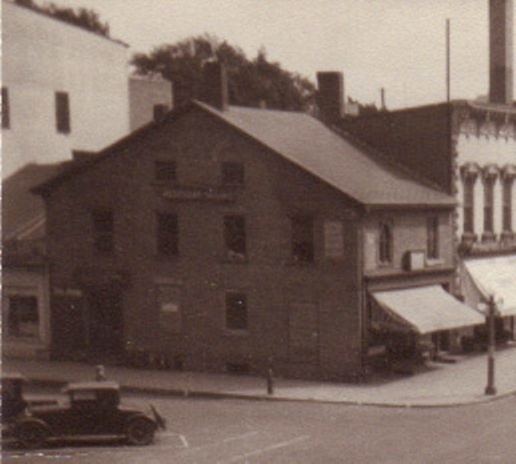 Downtown, the Alyce Shoppe on Market and Elm Streets was built in 1821 as an experiment to see if sandstone was practical for construction use. 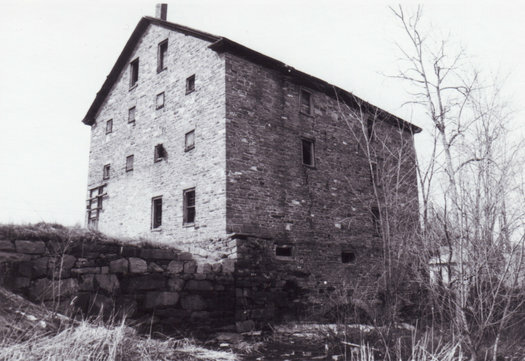 The Grist Mill next to the bridge on Maple Street was constructed in 1835 to replace the original mill built by Benjamin Raymond in 1805. 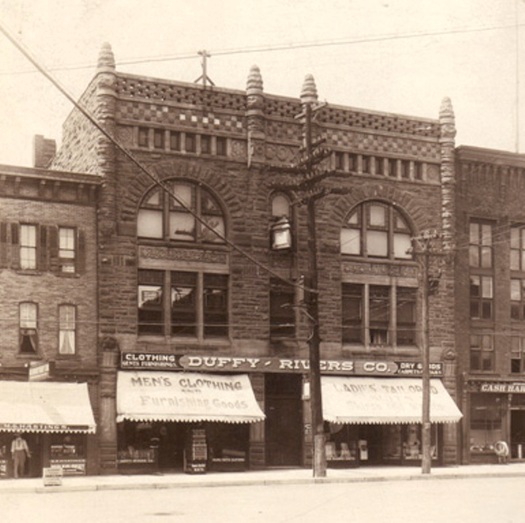 There are several other early sandstone buildings on the West side of Market Street. Rough ashlar style of cutting the stone was used first in the Potsdam Normal School built in 1867-69. 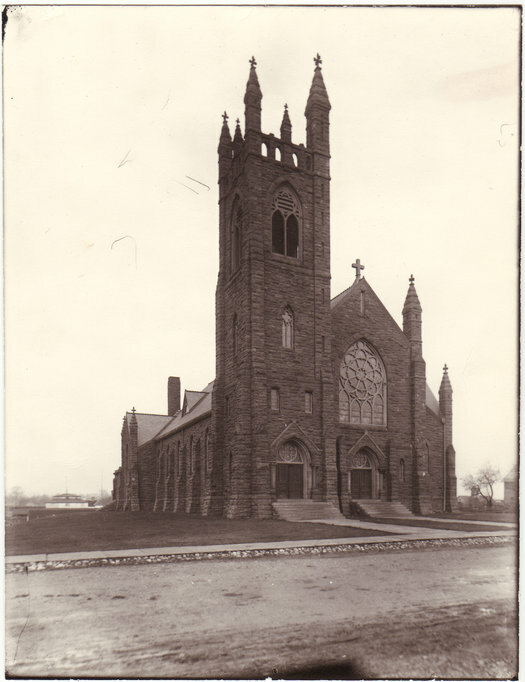 In the years following, the Presbyterian Church (1867), Herring Library, St. Lawrence University, Canton (1871), Town Hall, Potsdam (1875), Universalist Church, now the library (1876), the new façade of Trinity Church (1886), Trinity Chapel (1884), Zion Episcopal Church in Colton (1883-85), St. Mary’s Catholic Church, Potsdam (1898), Bayside Lodge and entrance, (1899), Cox Block (where Lewis Company is), Trinity Parish House (across the highway from the Episcopal Church), the new Parish House (1955) on the south side of the church, built of Potsdam sandstone from the old Clarkson carriage house next to the Parish House and the original Clarkson College Building (1896) on Main Street, were all built of Potsdam Sandstone in the rough ashlar type of stone cutting. 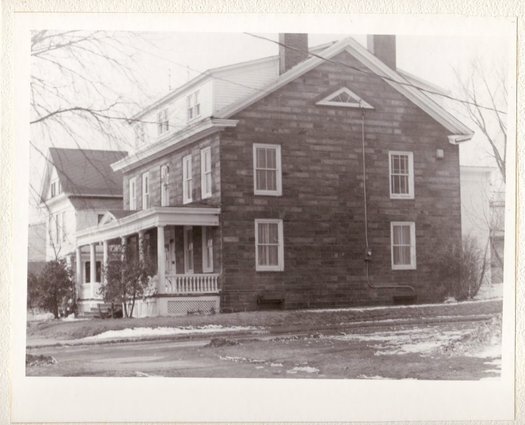 Mr. Carl Scheller’s home, 75 Elm Street, is the only residence in Potsdam of rough ashlar. 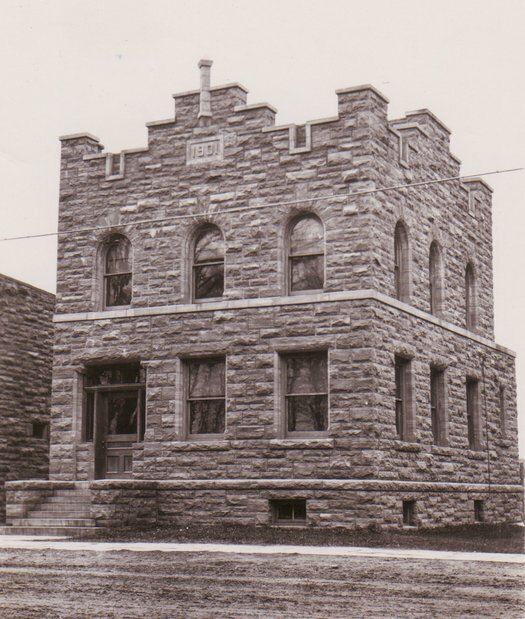 The Civic Center was built in 1934-35 of stone salvaged for the most part from the old town hall. 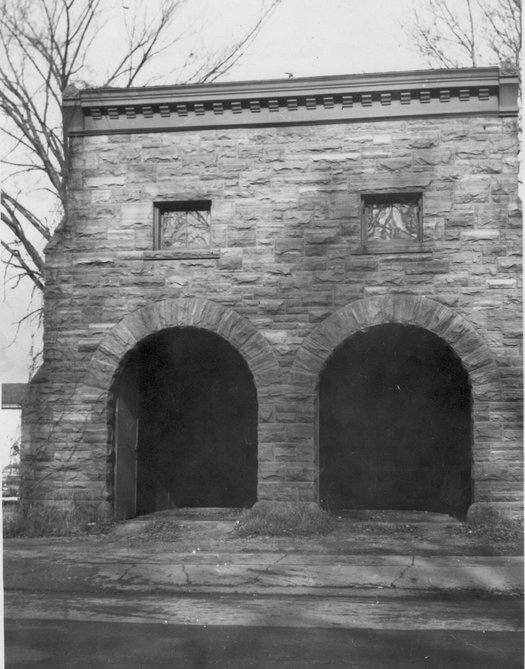 The New York Central Railroad Station at the end of Depot Street, was built of sandstone in 1914, replaced an older wooden one built in 1858. 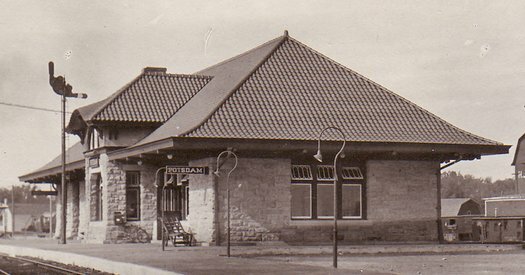 It was vacated in 1964 when passenger service ended and was turned into the “Railroad Restaurant” in 1968. 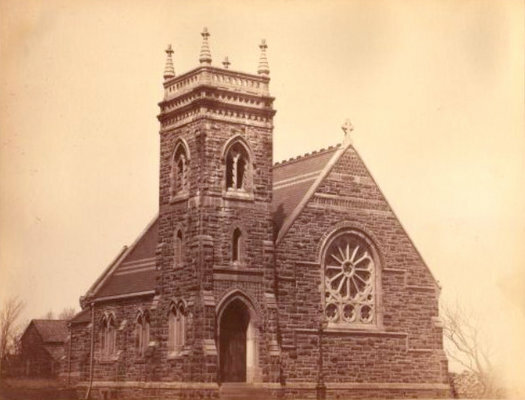 Potsdam sandstone was used for the Parliament buildings in Ottawa, Canada (1869) costing $4,000,000 and All Saints Cathedral in Albany, New York costing $2,000,000. 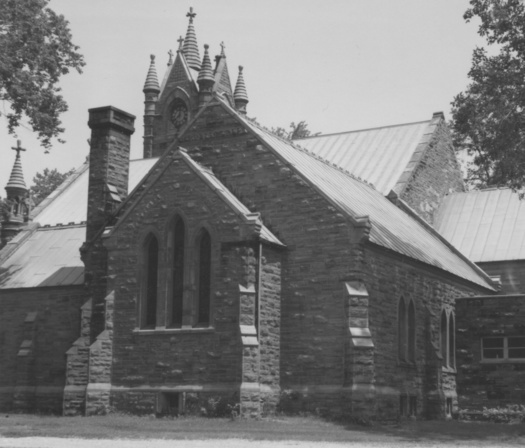 Glass factories located at Redford, New York and Redwood, New York in the 1830s, attribute the unusual brilliance of their glass to the use of Potsdam sandstone which was obtainable in their respective communities. Potsdam is justly proud of the extensive use to which its stone has been put.